The PSpice® Systems Option provides designers with a system-level simulation solution for their designs. Designers utilize PSpice simulation programs for accurate analog and mixed-signal simulations supported by a wide range of board-level models. MATLAB Simulink is a platform for multi-domain simulation and model-based design of dynamic systems. PSpice® Systems Option combines industry-leading simulation tools to provide co-simulations, simulation optimizations, parasitic extraction and re-simulation techniques. • Import PSpice simulation results into the MATLAB Environment and leverage advanced MATLAB plotting capabilities on the simulation results. 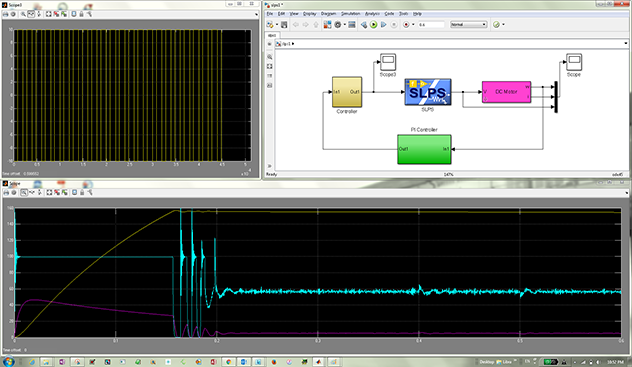 • The Simulink-PSpice Interface provides a design simulation environment for system and circuit level designs. PSpice Systems Options provides the capability to co-simulate full system level designs with industry leading simulators PSpice and MATLAB-Simulink. PSpice® Systems Option allows you to simulate with ideal and customized models to meet your simulation and accuracy requirements. Identify design problems early in the product lifecycle phase with ideal models. The unified simulation environment provided by PSpice® Systems Option provides the advanced capabilities necessary for electro-mechanical simulation. Large library of electrical parts for PSpice, electro-mechanical models and predefined custom blocks for Simulink. Cadence® PSpice technology offers access to over 33,000 models ranging from Amplifiers, Linear ICs, Data Converters, Memory and Power Management. Simulink library provides functionality ranging from complex mathematical operations, specialized custom blocks to digital processing blocks. The co-simulation environment provides mixed signal simulation capabilities for various technologies and applications including IoTand Automotive. Watch videos to see how to use PSpice Systems Option to perform system-level simulations that include customized electrical models of components. This video demonstrates how to integrate system and circuit design with the PSpice® Systems Option using an RC Circuit. This video demonstrates how to integrate system and circuit design with the PSpice® Systems Option using a DC Motor. This is a demonstration of how a Power Window Model from MATLAB can be integrated with the PSpice® Systems Option to showcase system level design techniques.